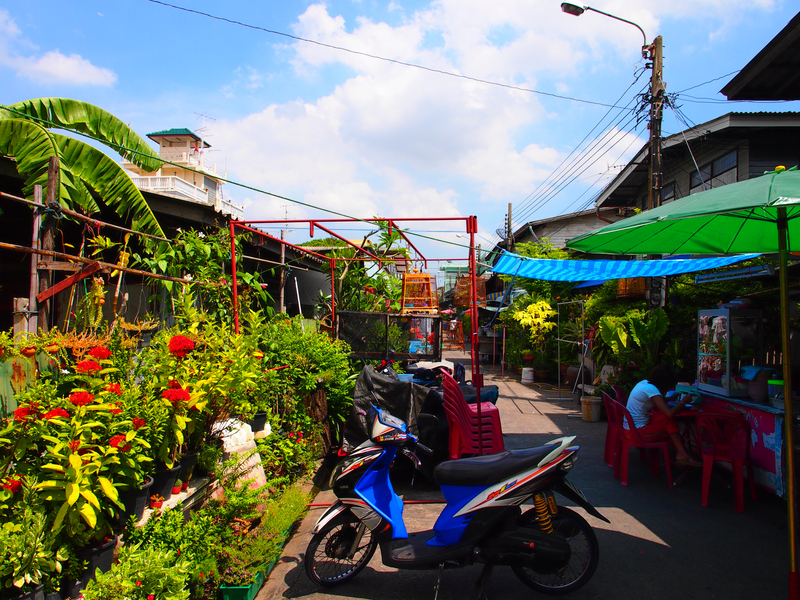 Neighborhoods in Bangkok are very diverse. 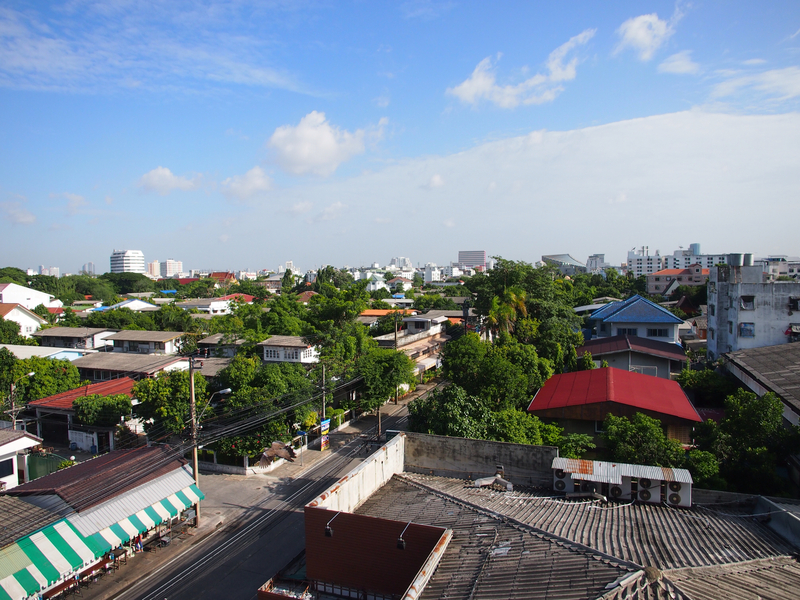 One mile away from the apartment is the bustle of Ramkhanaheng University and the Thai Sports Authority. 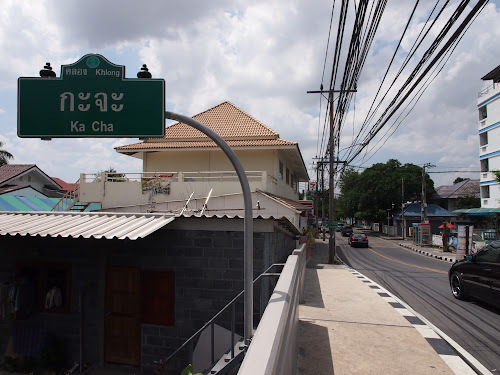 On that street, you will experience a massive traffic jam, and endless examples of street food. It's the Bangkok of movies. Where I am, it is rather quiet. On an annual basis, I come by to hang out with my old high school friend, Dr. Ton. He's permanently left the USA to do tsunami relief work, and he now resides in Bangkok. At night, it can be crazy. During the day, a lot of people either work, or they hibernate. I woke up at a decent hour, so I decided to go exploring. What do I see out my window? It's a mix of neighborhoods. That ugly corregated roof is a restaurant complex. Way out in the distance is what counts as a sort of Coliseium here, which is the Thai Sports Authority. As you can tell, Bangkok, although congested, is green. 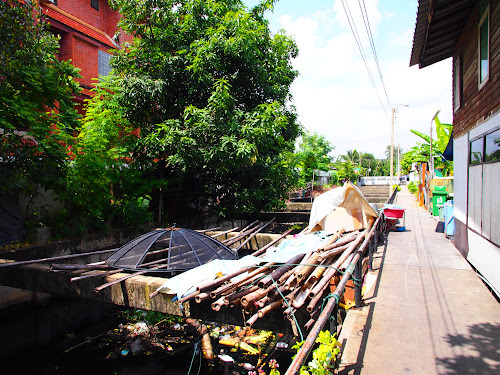 In between the apartment and Ramkhanhaeng is a khlong. 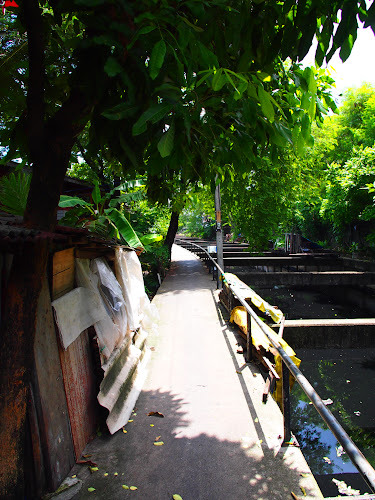 Bangkok used to be called the Venice of Asia, but they have been paving these things over in order to add streets to accommodate the ever increasing levels of traffic. The sidewalks aren't exactly the best, but a walk in the neighborhood reveals many small shops nearby. There are a number of coffee places, a barber shop and across the khlong (canal) a 7/11. By the way, 7/11 is everywhere, and it is where everyone goes for supplies. You literally can have a 7 every 2 blocks. 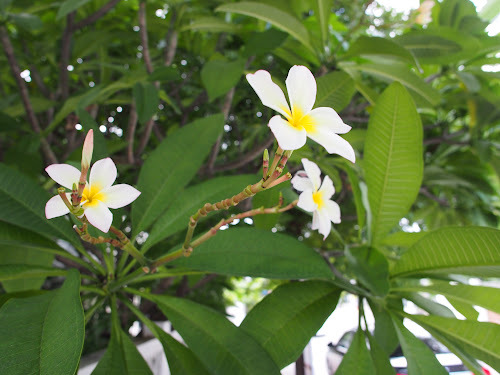 You will see all sorts of trees and flowers. 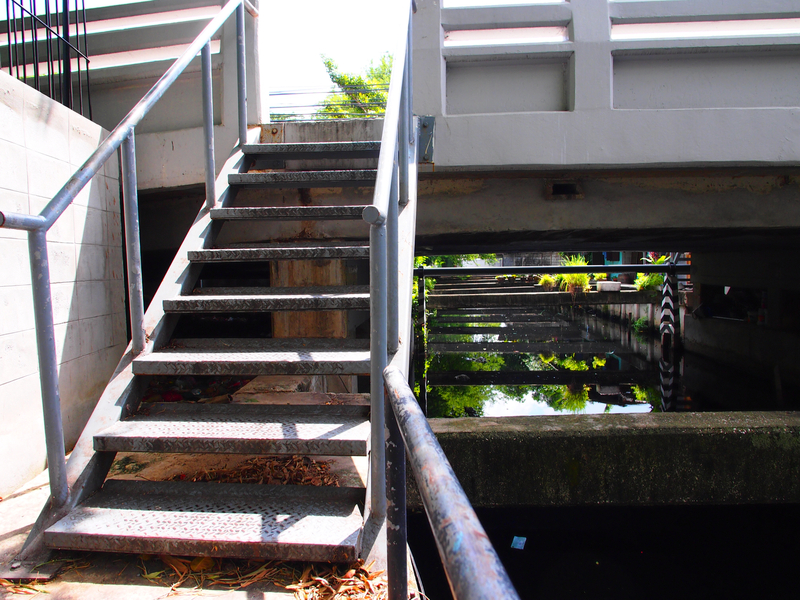 I was walking down the street towards the khlong, and came across this thing. 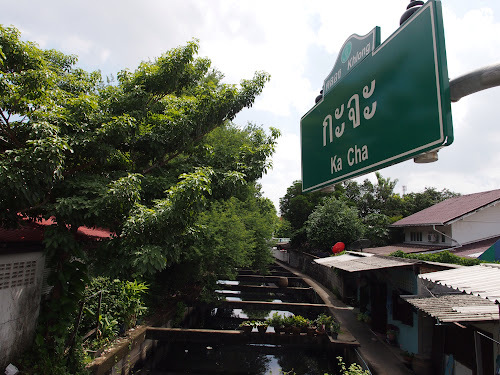 I am living very close to the Khlong KaCha. I'm standing on the bridge. One block from here is the 7/11 and a few other stores. They don't serve hot dogs like in the USA. They cut it up, and put mustard or chili sauce on it. No hot dog buns in this part of the town. Again, there are very very basic forms of housing right next to condo complexes. It's very green here, but the water is really polluted. You go down the stairs, and there is a walkway. I did this during the day, because I needed the light, and I don't like walking around during the evening in unfamiliar areas not populated by regular steady traffic. Still, it makes for some interesting photos. 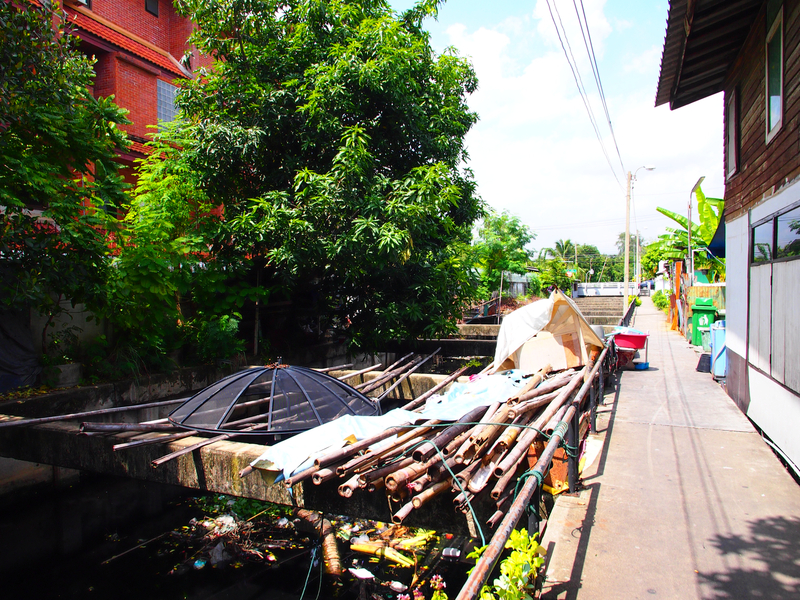 People store things on the concrete beams that stretch across the khlong. 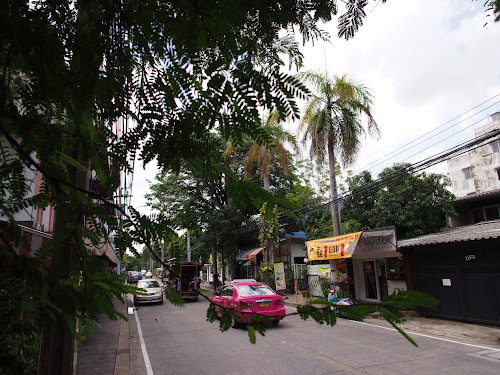 It can be rather unsightly, but in Bangkok, you don't have the code police writing you up. Along the khlong, there are numerous small streets. There are small mom/pop restaurants, and the color of the city is again green. 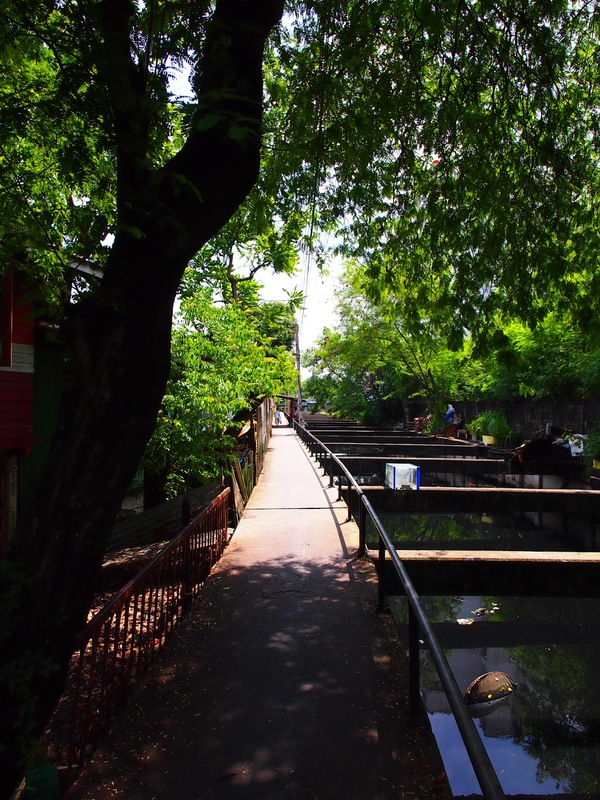 It is actually a pleasant walk. You can tell that there are people who are sort of just scraping by with the patchwork of housing along the way. But then, it is sort of cool to have this in your backyard. I just wouldn't recommend you do any fishing or swimming or anything else in that water. It's really smelly.